Out upon the green plain, wild horses galloped and played. If they noticed the huge lichen-encrusted stones that huddled in an ageless circle there, it was only to rub their shoulders or haunches now and then or to play hide-and-seek with those small colts still unable to run far. They took no interest, either, in the line of posts or strange piles of sweet white goo distributed about the area. Hmm . . . it’s hard to make that work! We’re not sure why the horses, why the odd asymmetrical candle line or what the (possibly marshmallow) lumps are that are scattered about this cake. And then there’s that thing in the upper left hand corner. Many mysteries. We do know this cake was made for a birthday party in November, 2008, a party attended by members of Greenwood Morris, a Morris Dance team out of Gainesville, Florida. More photos of the party may be seen here. Score: a modest 5 druids. Tis is a rather simple henge, appropriate for the occasion. You don’t have to do anything elaborate in order to enjoy a henge at your next family, social or business occasion. Let henging in and watch your quality of life soar!. And absolutely no calories (as long as you don’t eat it). Your Christmas card from the Clonehenge blog. Have a merry day, whether it’s your holiday or not! There can be no doubt that is Stonehenge. 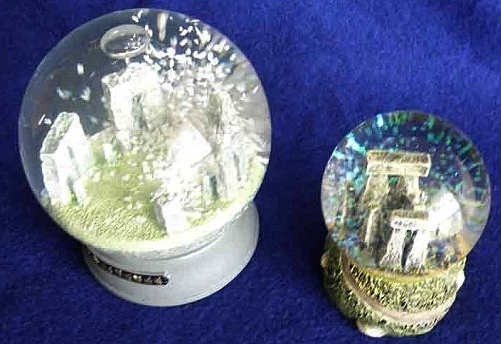 As Bob at Stonehenge Collectables says, “Had the graphics artist who produced the artwork for box and label created some stones graphically and not used an identifiable view of Stonehenge taken from the south, looking north, any commercial connection to Stonehenge could be disavowed.” True except, as we said, for the trilithons, which you won’t find in any other ancient stone circle we know of. We’ll give this 5½ druids, partly for that little walkway spiraling up the base toward Stonehenge. It would be six if they’d used something white instead of that clear plastic glitter. Don’t they know that’s for unicorns? We”ll end with this photo of last year’s and this year’s globes, and a warm wish for a joyous Yule season for all of our readers, wherever and whoever you are, whatever you believe, and whoever you love ! Sometimes They’re Even Made of Stone! Was zum Teufel ist das? No one likes to talk about it much, but let’s face it–we all know the Swiss are a little odd. They live up there in the mountains practicing for war, drinking hot cocoa and using one tool for every job you can imagine, including carving both ornate clocks and those little holes in their cheese. What kind of life is that? But we’re not here to judge! We’re just saying it’s not surprising that this Stonehenge-ish thing near Bern is, well, unique among things we have posted. Just look at all the little legs, ahem, we mean uprights, under some of those boulders. And even the trilithons on the far side are odd, with those cylindrical uprights beneath them. But it does seem to be a circle, more or less. The article indicates this woman has something to do with it. If she applies, we’ll give her 6 druids! While we’re posting replicas made of stone, we have to post this awesome one made of rocks and Legos, with workers in action moving and erecting the stones. Made by a boy named Aidan Dwyer, it is Rock-Henge, Grand Prize Winner of the “Win a Trip to LEGOLAND” Contest. Well done! posted with the permission of the photographer, Kristborg Whitney, is one of the nicer ones we’ve seen. It was photographed on Monhegan Island in the state of Maine, and, no, we do not know what that thing is on top of the nearest lintel stone. Just as well–life is richer for some of its little mysteries! These things appear all over the world. Of course we assume they’re not built by tiny druids or aliens or faeries, but who knows? It’s just an assumption. Although the fellow in New Zealand who posted the following photo on Webshots seems rather certain: Mini Stonehenge built by some douchebag with way too much time on their hands . We’ll be posting briefly once or twice again this week, holiday things. In the mean time, we wish everyone a joyous and meaningful solstice, whether you celebrate it tomorrow (in the modern calculation), Tuesday (in the Celtic manner), or on the 25th (in the Christian manner). May the sun shine upon you and bless you! At Clonehenge we scour the earth for replicas so you don’t have to! Today we bring you an entry from the exotic land (unless you’re from there!) of KwaZulu-Natal in South Africa, the east coast city of Durban, where the South African Orchid Council held their orchid show in September. 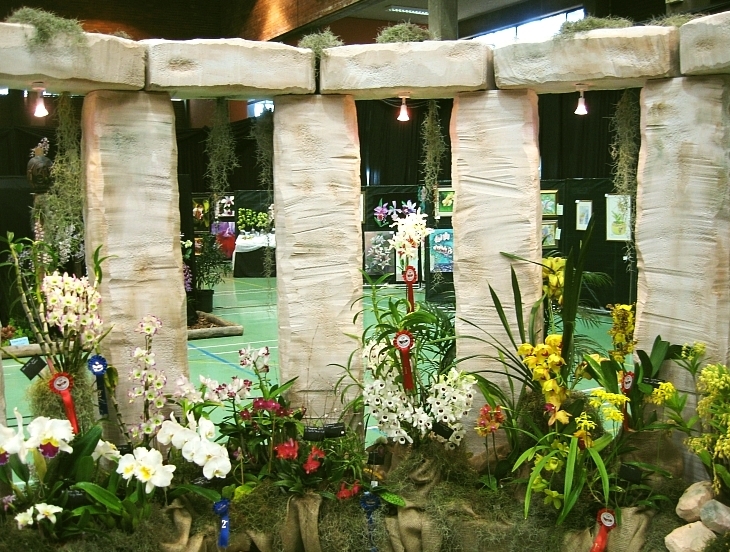 The winning stand in that show, created by the Eastern Province Orchid Society, was (Ta da!) Stonehenge! Scroll down a little at this link for more pictures. We offer our congratulations. Very early on, we thought of miniature golf courses as likely Stonehenge replica sources, but we can’t believe we didn’t think of flower shows until now. It seems so obvious! The beauty of it is, flower show people have that tendency to be meticulous and to do things right. Hence this rather nice ring with the Spanish moss draped over the lintels. And who knows–maybe they’ve hit upon something here. Not that orchids were associated with Stonehenge necessarily, but what about plants? Could certain plants have been associated with and planted around certain megalithic sites? Perhaps research has been done, analysing pollen from certain levels of excavations, but we haven’t heard of it. We can imagine medicinal herbs or others regarded as powerful in other ways transplanted there to add to the mystique of the site. Or maybe not, but these days Stonehenge replicas are often associated with gardens and plantings. The graceful curves and gentle chaos of ephemeral plants are shown off to great advantage against the solid ageless stones, or at least their imitators. Score: 6½ druids for Stonehenge of the Orchids. It manages to be both humourous and stately! A combination we could all aspire to, especially as the holidays come on. Note: In the Durban area, evidence of human occupation goes back 100,000 years. Stonehenge, by comparison, would be modern there. We had this bookmarked for quite a while, uncertain whether it belonged on the blog, but then a friend of Clonehenge (Mr. P.G.) sent us the link asking if we’d done it yet, so here it is. Last year, 2008, Liverpool was designated European Capital of Culture by the European Union. As a contribution toward that, John Hill and others from the University of Liverpool by a very simple method including a rope, simple counting and the sun’s shadow, laid out the pattern of positions that would be necessary for a model of Stonehenge. They then measured out a smaller pattern to suit the site and proceeded to dig a ditch and bank and mark the sites of the Aubrey holes. You can see a diagram of this stage of the original Stonehenge here. A fuller explanation of what Hill and the others did can be read in the article we mentioned. You can see the result above. This construction certainly qualifies to be posted on Clonehenge, going by Rule Number 6 of our Rules of Henginess, and is in fact the first henge to qualify on that basis alone. A Stonehenge replica without uprights or trilithons–we were waiting for this. Well done! They placed the earthen bank on the inside of the ditch, too, another distinctive feature of Stonehenge, as other henges tend to have the ditch on the inside. These things may seem minor, but they are pleasing to find in a world where one trilithon of anything is called a henge. This is a true Stonehenge replica, a replica of the developmental phase of Stonehenge called Stonehenge 1 (the phases are described on this Wikipedia page). So how do we score this? We haven’t even found anything to mock or be silly about, but we don’t deduct points for that, tempting as it might be. Score: 8 druids. Because if druids had been involved in building Stonehenge instead of coming at least a millennium later, this is very much like what they would have built at this stage.The article points up that even the astronomy and celestial/landscape relationship have been painstakingly provided for. What more could we ask? Well, there’s the question of ambiance. The spot is perfect for what its creators were doing, but here at Clonehenge, Stonehenge is not just a work of engineering and astronomical precision. We have learned that some people see it as sculpture, some people see it as a sacred site, and many people regard it with awe. (Let’s face it–gigantic looming stones–ftw! *) If Stonehenge looked like this, there wouldn’t be so many replicas and we wouldn’t be talking here, but this is brilliant and we will add it to our list of large permanent replicas!